Pete Ross and Kenny Braverman visit Clark in Metropolis. Clark meets them and the old friends joke and laugh about Clark's new life in the big city but there is an undercurrent that Clark is losing touch with his friends. They go to an art show given by Jimmy Olsen where the tension between the friends grows and finally boils later at Clark's apartment. Pete yells at Clark about how he has been acting and the fact that he's not living up to his potential. Clark leaves and tries to fly into space which doesn't go so well and he has to be saved by the Green Lanterns Abin Sur and Tomar-Re. The Lanterns talk about the fact that Abin has been watching Superman's development and mentions the name "Krypton" and Clark begs them to tell him more. Instead they send him back to Earth and the next morning Clark and Pete patch things up. Pete is still a bit of a jerk and warns Clark that he needs to get his head in the game because real monsters are coming. They hug and Pete heads back downstairs. Clark watches the sunrise and thinks of the name Krypton. Story - 2: On a technical level this story isn't bad. There is a beginning, a middle and an end. The main character goes through some growth and there is a general theme that runs through the piece. I am guessing that Max Landis wanted that theme to be Clark accepting the fact that he isn't living up to his potential and only through the harsh words of a friend does he begin to accept this fact. If that was his aim Landis fails on a spectacular level. To be fair I'm bringing my own baggage to this story but after going through several months of Superman comics where just about everyone is mad at Superman it's annoying to come to a story that is about his early days and here we have more people mad at Superman for because they don't like how he's been acting. Again, I am guessing that Landis is trying to show that Clark has changed since his time in Metropolis and is growing apart from his old life but he also throws in the whole "monsters are coming" thing and the combination of the two doesn't work. Pete Ross is supposed to be the cold water getting thrown in Clark's face but he ends up coming off like a complete jerk about the entire situation. From the moment Pete and Kenny step off the bus and see the image of Superman behind Clark there is this feeling that they think Clark is being big headed. Because it's his fault that someone painted a mural of Superman near the train station. Then they give him a hard time about his costume and his disguise. They also seem have an issue with the fact that Lois is dating other people. All of that is fine and dandy, dandy and fine but later in the issue Pete goes off the rails and starts yelling at Clark that he's not doing the whole "being a hero" thing right. Clark should contact others like him. Clark can't be alone forever. Clark needs to start living in the here and now because if he doesn't he's letting everyone back at home down. Oh and worse threats are coming so Clark needs to be ready. It's all very human and very relatable because I think most of us have had this moment but at the same time it just comes off as more characters telling Superman that he's doing what he does wrong and it's just so tired at this point. I'm not suggesting that Clark is free from blame here. He does come off like a jerk himself on several occasions, like when they are getting ready to go to the art show and he tells Kenny and Pete that they look like tourists. He's also losing touch with his friends and has missed the several attempts Kenny has made to tell Clark about his upcoming wedding. So Clark is not innocent of acting badly but I don't think he deserves the two speeches that Pete throws at him through the course of the story. He's trying to figure this whole thing out. There is no instruction manual on how to become a super-hero and while Pete's heart might be in the right place he's going about talking to Clark all wrong. My other big problem is who is Pete Ross to say these things? Pete stayed in Smallville. He and Kenny are living the same lives their parents lived and now he comes to the big city and tells Clark he's not doing right and that he's letting everyone down? That doesn't scan with me at all. Instead of coming off as the good friend saying the things that someone needs to hear he comes off as a high and mighty country boy telling the city boy that he's not doing right. Because of that everything Pete does feels forced like Max Landis wanted to write about the idea that Clark isn't living up to his potential so he uses Pete as his soap box. The thing is Pete is Clark's old friend from Smallville that never left town. Clark is the one that went off and saw the world. Clark is the one that has to deal with how to use his abilities to help people. Clark is the one staking a new life outside of where he grew up. Is Pete the right choice to tell Clark he might be acting like a jerk? I'd buy that. Is Pete the guy to tell Clark that monsters and bigger threats are coming? No. He's the absolute worse person to do that. Oh, and Batman had to get a mention because he's Batman and every Superman story could always use more Batman. Between Pete's speechifying and the scene with the Green Lanterns this series is clearly not about Clark learning to be Superman. With the exception of the first issue it seems to be about people telling Clark that he's doing everything wrong. Everyone else knows so much more than him about everything and it ends up making Clark look like a chump and if every other bit of Superman that we've been given over the past few years wasn't like this I might be able to accept what Landis is doing but because Superman has been on the wrong foot so much lately this just feels like someone piling more salt into the wound. I'm going to be glad when this series is over. Art - 4: The art had a real independent/Vertigo feel to it. That's not a complaint by any means. It was just my first reaction to it. Jonathan Case draws extremely expressive people and his style suits the character driven nature of the issue. I may not like what happened but I can recognize that the art is very good at telling the story and letting us know what the characters are thinking by the expressions on their faces. I wouldn't want to see Case draw a more action driven, mainstream Superman story but he did a fantastic job with this issue. 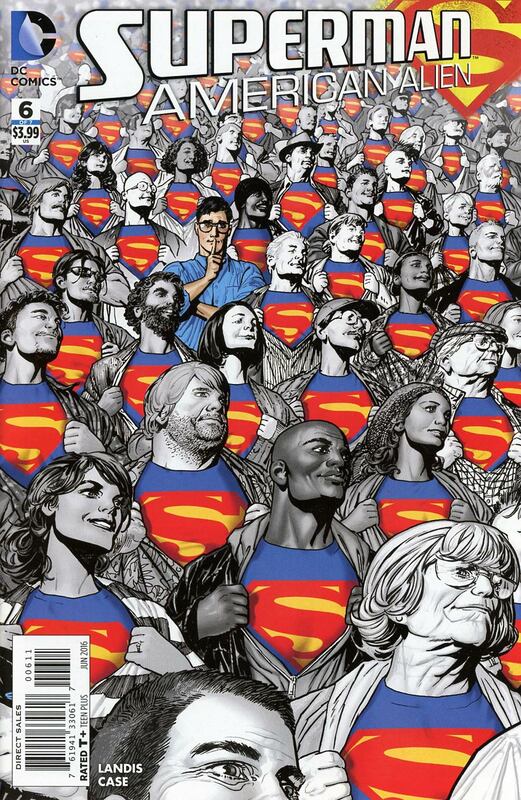 Cover Art - 4: I am assuming this is the Where's Waldo cover or I guess Where's Clark is more appropriate. All snark aside this is a striking image and I like that Clark is doing the little, "Shhh," thing. It's cute. The color scheme is great as well with the blues, reds and yellows really popping against the grayscale of the rest of the cover. Variant Cover Art - 3: The composition of this cover is fine. 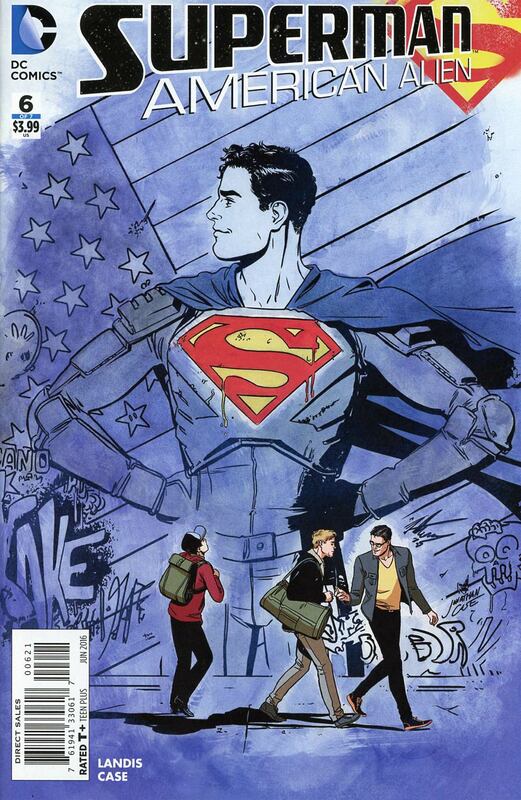 The image of Superman and the American flag in the background with Pete, Clark and Kenny walking in the foreground. It's a nice commentary on the themes of the issue. The problem is that the Superman costume is just awful. You know what Superman doesn't need? Elbow and shoulder pads. It's too busy and frankly the overly intricate costumes of the past ten years or so are getting tiresome.